"That the bigger the star is, the more bright it is. I would have figured it would be the opposite, as I feel smaller stars would be hotter. (Actually while typing this out I feel like I answered my own question, whoops!)" "Star fusion, because I had always kinda wondered what gave stars their energy ,and although I'm not 100% sure still i know it has to do with squeezing hydrogen." "That helium is the result of hydrogen molecules being squeezed together. It makes sense that the sun is the result of hydrogen being squeezed together because that explains why the sun is so hot. Hydrogen does not want to fuse and that is why when it does, it creates heat." "Cheerleading! I never thought of mass and fusion to be like cheerleading, finally some language I can understand." "The fact that all the stars are so different and unique is awesome, and makes one wonder how they all came to be the way they are." "Hydrostatic equilibrium was really cool. Plus it makes sense to me." "The interstellar medium. I thought it was very interesting how the interstellar dust is about the size of the particle in cigarette smoke!" "The ability to tell the composition of clouds by their colors, because I've always wondered how they're able to so clearly decide what things are made of that we'll never be able to get to." "It was cool to see the different types of nebulae and see what each one is composed of." 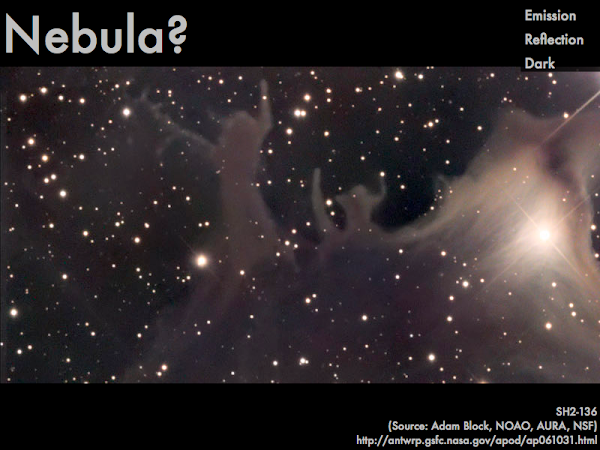 "Classifying and identifying nebulae, once broken down into three categories. And I loved learning about star formation in molecular clouds." "Star clusters and nebulas because the pictures are really cool." "The house party model was interesting because it helped me a lot to understand." "Compare stars to house party guests, because I really enjoy when concepts are connected to real-world analogies that help to further one's understanding of the fundamental principle of the subject." "Talking about the house party and how it differentiates between the early-goers and late-goers, and how they relate to stars." "Nothing was that interesting for me." "Using the H-R diagram for this project is confusing to me because learning specifically how we are supposed to use these diagrams has always been a struggle for me. Rather than memorizing facts and concepts, it requires a different style of learning that takes more time for me and I get left behind and end up trying to figure everything out on my own at home. That's why this type of thing is personally confusing to me. " "At first when I saw Hertzsprung-Russell diagram I was nervous because it all appeared confusing. However once reading more about it and seeing more and more examples it’s beginning to look like a concept I may actually be able to tackle." "Why stars on the main sequence line are ordered according to mass while the other stars are not?" "Please go over fusion, I kind of get it but it's not that clear." "Fusion and how the pressure and temperatures work, because I can't visualize what is happening, and have a hard time wrapping my head around the concepts." "Why a low mass star is less bright than a larger mass star. Is it because the bigger mass stars produce more pressure due to squeezing, which creates more brightness?" "Nebulae. These were confusing because I didn't see how we know which light to look for, which was one of the questions." "Interstellar redding. I understand that dust cause the stars to seem more red, but I don't understand why when and where this happens and the connection to wavelengths." "The turn-off point, I do not understand what it is." "I am confused on what a house party has to do with star cluster age." "A lot was confusing because I didnt have any time to get to this during the week--all my classes have tests and I messed up. :("
"There is not enough temperature or pressure to overcome repulsion of protons." "This is implausible because the hydrogen will not have enough speed at a low temperature to collide and stick together." "Because in order for the fusion of hydrogen atoms, there would need to be lots of movement. There is less movement at room temperature so the atoms will not be moving as much and thus will not fuse." "Fusion has been shown to us to happen at extremely high temperatures. We have yet to see any examples of this kind of fusion happening at room temperature." "Because fusion reactions can only occur if they overcome the coulomb barrier which requires being very hot in order for atomic nuclei to make violent collisions." "Please disregard the last quiz, I am begging you." "I understand this reading assignment more than the other weeks, however I still need some explanation of some things in class." "I love how you relate human and things we do a lot to astronomy." "I'm just extremely lost. I understand a lot of what we have gone over but I don't even know where to start with questions because I am just so confused." "The whole section in the presentation about star clusters and their 'turn-off point' is difficult for me to grasp. I'd love more clarification on it." "I expect a house party soon." "When's the house party again?"